Fuel economy labels tell buyers how much it costs to run a vehicle. If you're a registered motor vehicle trader, you are required to print labels to display on vehicles for sale and provide fuel economy information on websites offering vehicles for sale. Simply enter a vehicle's details into our label generator to generate fuel economy information and a label. You can use the generator to print labels for multiple cars. The fuel economy labelling programme is looked after by EECA in consultation with the NZ Transport Agency (NZTA). We've moved the fuel economy label generator to the EECA website and made it easier for everyone - traders and private sellers - to produce the vehicle information and labels they need. Only enter one option at a time. Use VIN or Plate number if the car was first registered in New Zealand more than two days ago (the database is updated with VIN data nightly) - otherwise try Chassis number. What's the VIN and where do I find it? Read NZTA's factsheet for more information. What's the Chassis number and where do I find it? The Chassis number is the manufacturer's numbering system and varies in format depending on both the manufacturer and the jurisdiction in which the car was first registered. The chassis number will be on a metal plate on the firewall of the car. In New Zealand, chassis numbers are only routinely recorded for used imports. What's the Model code and where do I find it? The Model Code used in the database is provided by new car manufacturers to identify cars of the same make, model and sub-model. It will be provided by the manufacturer along with other information about the car. There have been a few cases where the model code supplied by the manufacturer to the database is slightly different from the model code given to the trader. If the model code you are using does not generate a label, check with the manufacturer. The model code can be found on an export certificate near the top just below the dates - it looks something like this "CBA-ACD03"
What's the Variant and where do I find it? The variant is described as the "classification number" on an export certificate - on the last row of details between the "specification number" and the "length"
Select a label if you want to display it on a car, or text information if you want to use it in a website listing or elsewhere. The print file can include multiple labels. To print the label, you'll first need to create a PDF, and you'll need Adobe Reader installed, you can download it here. Make sure you choose "Clear all labels" after you printed a set of labels. WARNING: The Fuel Economy Label layout and content must not be altered in any way, in accordance with regulation 6 sections (4)(5)(6) of the Energy Efficiency (Vehicle Fuel Economy Labelling) Regulations 2007, but it may be made larger (reg 6(6)(a)). These regulations also include the requirement to "Clearly and prominently" display the label. DISCLAIMER: The Fuel economy label generator tool is designed to provide consumers with an estimate of how much it costs to run a vehicle. It also allows motor vehicle traders to print fuel economy labels for display on cars. You will be asked to input details about the vehicle you are enquiring about. The tool will then provide you with a label that indicates the fuel economy in litres per 100km and a rating out of 6 stars. 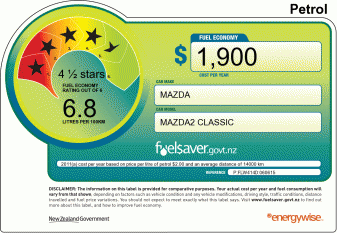 The fuel economy label generator tool incorporates data sourced from the NZTA RightCar database.